While it's true that premiums for the popular silver Obamacare plan could shoot higher for 2018, most enrollees could actually end up paying less for coverage next year. It's because premium subsidies are soaring too, making many plans on the exchanges more affordable. The Trump administration, however, is stressing how much premiums will rise, saying this is yet another sign that Obamacare is irreparably broken. Officials are downplaying the fact that the subsidies will cover most, if not all, of the increase for many consumers. Obamacare advocates worry that consumers will be scared off by the news that premiums are skyrocketing for next year. 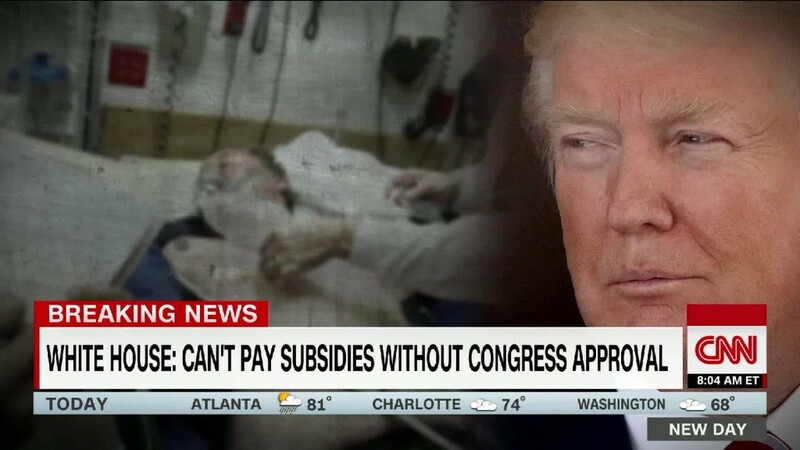 They plan to highlight the fact that many people will be able to find lower-premium policies thanks to the subsidies. Even the Trump administration found that Obamacare plans will be more affordable for many consumers next year. Some 80% of enrollees will be able to find a policy for $75 a month or less -- up from 71% this year and the highest share so far. "This year, more people than any previous year have access to a plan for $75 or less," said Josh Peck, a former Obama administration official and co-founder of Get America Covered, which is promoting enrollment for 2018. "That's what we want everyone to know." Many insurers jacked up the rates of their silver plans in part to make up for President Trump ending federal support for Obamacare's cost-sharing subsidies. These subsidies reduce deductibles and co-pays for lower-income enrollees. The premium subsidies are pegged to a benchmark silver plan in each market. So if that plan's rate rises, the value of the subsidy does too. More than eight in 10 Obamacare enrollees receive premium subsidies. Insurers, however, did not hike the price of bronze or gold plans nearly as much. The rate of the lowest-cost bronze plan is rising 17%, on average, while the cheapest gold plan is going up 19%, according to the Kaiser Family Foundation. That means the more generous premium subsidies will cover more of the monthly cost of these plans, so consumers will pay less. A 40-year-old earning $25,000 will pay 75% less, on average, for the cheapest bronze plan and 21% less for the lowest-cost gold plan, according to a new analysis by the Kaiser Family Foundation. A 40-year-old earning $40,000 will see a 28% drop, on average, in the price of the cheapest bronze plan, and an 8% decrease in the least expensive gold plan's premium. Bronze plans have lower premiums, but their deductibles are higher -- nearly $5,900, on average, for an individual in 2018, according to a new report from Health Pocket, an online health insurance shopping tool. Meanwhile, gold plans have higher premiums, but their deductibles are only $1,320 on average for a single enrollee next year. The cheapest gold plan will have lower premiums than the least-expensive silver plan in 459 counties next year once subsidies are factored in, Kaiser found. Silver plans will have an average deductible of just over $4,000 next year. Many more consumers will be able to enroll in bronze plans and pay nothing each month. For instance, a 48-year-old consumer earning roughly $30,000 can find a zero-premium policy in nearly 1,050 counties next year, up from 132 counties in 2017, according to an analysis by Oliver Wyman consulting group. Not everyone, however, will be so fortunate. Enrollees who don't qualify for premium subsidies -- those who earn more than $48,000 as an individual or $98,500 for a family of four in 2018 -- may be hit with the full premium hike. They may be better off buying bronze or gold plans or looking for individual coverage outside of the Obamacare exchanges. Open enrollment begins Wednesday and runs through Dec. 15 in most states.